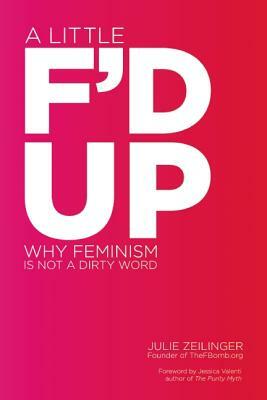 A Little F’D Up: Why Feminism Is Not a Dirty Word by Julie Zeilinger, Founder of TheFBomb.org. Young women today have a bad reputation, and for good reason: They’re sexting their classmates, they spend more time on FaceBook than they do in class, and their appetite for material possessions and reality TV is matched only by their overwhelming apathy about important social and political issues. Right? Wrong. FBomb blog creator Julie Zeilinger debunks these (and other) myths about modern youth in A Little F’d Up, the first book about feminism for young women in their teens and twenties to actually be written by one of their peers. * In this accessible handbook, Zeilinger takes a critical, honest, and humorous look at where young feminists are as a generation, and where they’re going—and she does so from the perspective of someone who’s in the trenches right alongside her readers. Fun, funny, and engaging, A Little F’d Up is a must-read for the growing number of intelligent, informed young women out there who are ready to start finding their voice—and changing the world. *Julie Zeilinger was teenager when she wrote A Little F’d Up. It came out in 2012, and Julie isn’t set to graduate from Barnard College until 2015. I needed this TED Talk video today. I also needed her other TED Talk. I hope they’ll inspire you to keep creating and keep showing up for your part of the job. This weekend is RavenCon, so I’m sure I’ll find more weekend reads by great authors. Meet me there and we’ll find books together. Happy weekend! *#FridayReads is the brainchild of the fabulous Bethanne Patrick (@TheBookMaven on Twitter). It’s a Twitter conversation for every bibliophile to share loves and find new ones.